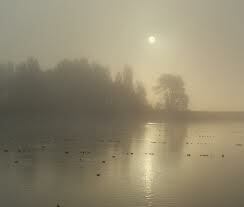 Of a foggy foggy day, filled with grey skies so low and looming that one could easily slip away in them, vanish like the ferry as it skims to and fro. The fog has finally cleared and the reflection of the lights on the water seems oddly bright. Even the ferry lights seem shinier than usual, against the fog-calmed sea. I’ve been feeling foggy, myself. Lots going on, various family and non-family tragedies and worries, enough to keep my brain spinning unproductively in the mist. Toss in another school shooting, more horribleness about the fascist-leaning land to the south, and the fog deepens. A good friend of mine writes satire and humour about the Trump government – I’ve told him I can’t read it anymore. I used to keep track of the lies and foolishness through twitter and news sites; I can’t anymore. Of course, this is what the “they” want. Numbness vs. outrage, passive acceptance. Our own Canadian government clothes platitudes in tight pants and expects us to not see their real plans. Meanwhile, the oligarchs plan and plot and gradually little bits of our life and our planet are teased away from us. Back when I was younger and full of piss and vinegar, I used to take this on (that’s me on the right, a rare thing). I wrote letters, went to protests, was active in party politics. I’d love to do that again, but I realize I can’t – my brain doesn’t hold onto facts anymore (if it ever could) and my arguments slide away into inappropriate confessions and parries and thrusts with blunt weapons. I embarrass myself. It’s truly awful. As I get older I keep my mouth closed more and more…or regret speaking more and more! So I pull the fog blanket over me and go play with my art, wander around my ‘hood, filled as it is with comfortable people who smile and greet me, distract myself with movies from more innocent times, drink a glass of wine. I need to pass the torch on to others whose brains can formulate arguments and make sense. They need to keep their noses to the grindstone, their foot on the pedal, to blow away the fog of fatigue. I can’t anymore. But maybe that’s okay. The kids know much more than I ever did. I foolishly rented a 14th story apartment for the view. Often it’s glorious – the harbour opens invitingly out of my bedroom window, and lake MicMac winks at me from my den and living room windows. I often while away non-writing hours watching the rowing shells draw circles and figure eights around the islands in the middle of the lake, take a fantasy ride along with them, curse with them the motorboat people doing doughnuts in the middle of the lake. But for the past two days, the fog has been so thick I can’t even see the trees reaching their arms up to me. Birds flying by appear suddenly, like fish in a curved aquarium. The cat startles, unsure of how these pigeons are appearing. My apartment is shrouded in grey light and I am compelled to descend and walk on the earth to prove to myself it still exists, solid and still autumnal. And so we spent many evenings carrying two protesting cats down 20 stories after the fire alarm went off. The place where we lived had a resident who would set off the alarm to get the cigarette butts people would leave behind while the alarm got shut off. We’d all be outside for half a cigarette or so, and she could gather up the leftovers as we rushed back in from the cold. We didn’t smoke, thank gods, since we often had to climb back up the 20 stories or else wait hours with struggling cats in the lobby. 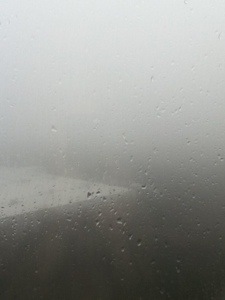 In the midst of the fog, I’m drifting through a nanowrimo novel. I’m following my character around, watching with bemusement as he talks to people, does different things, makes love, creates mayhem. The path forward is as foggy as the view out of my window, but I’m liking the experience of drift. It’s fun being surprised by what he does, what other characters do in response. So I’ll take the fog for a while longer. It’s early morning, day two. I’ve just been up to drive my son to the airport for his year away in Istanbul. So I’m feeling foggy from the early hour, blue because I miss my darling boy already, and tired. Today is the day I start throwing horribleness at her. It’s going to be unpleasant as I dangle her from precipices, threaten her life, her sanity. I am feeling sorry for her already as I kind of like her gutsy character, sketchy as needs must, be given she is just coming to life. I’m hoping she’s strong enough to fight back at these slings and arrows of my generated outrageous fortune. We’ll see. For now, I have to have just a wee bit more sleep..perchance to dream. Sometimes a high-in-the-sky view can be overrated. Today my building is wreathed with clouds and rain; yesterday the wind was howling persistently through my windows. I can’t see the ground. It all got me to thinking about being high above things, as vs down and dirty in amongst them. It’s easy, as a writer, to step back from life and observe. Fun to watch and note and “see without being seen” as my kids’ favorite game Scotland Yard says. Sometimes fun to envision playing with bloodless characters like chess pieces, moving them here and there, seeing how it turns out. But I don’t think that’s where good writing resides. I think the writing I enjoy anyway is the writing that is on the ground level, below the clouds and mist, face to face and intense, filled with muddy puddles and those splashes when someone drives by and hits one. The writing of out-flipped umbrellas, waving tree branches, surging waves on a shore. To get there, occasionally you have to get out in your world, experience it, feel is around you, meet people you’ve never imagined exist, have shocking and friendly and scary and enjoyable experiences. For that, you also have to be involved. Get your hands dirty, touch the world around you. Get to know people more deeply than the surface hello, understand motivations, hear histories.